“Packing Into The High Country’’ courtesy of Arnold Mosley. 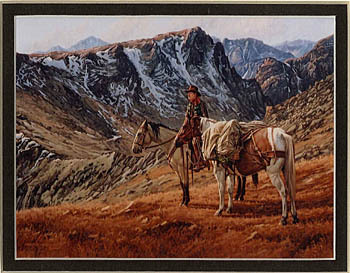 Packing Into The High Country" -Arnold Mosley. From his earliest childhood Arnold has been both an artist and a rider. Born in 1941, in Beaverlodge, Alberta, he was introduced to wilderness when he was six months old and his mother carried him, on her horse, into a remote area south of the Wapiti River. Even then, he was probably noticing the landscape he would one day paint. He grew up on his family’s homestead, a mixed farm along the Wapiti River, in the South Peace district of Alberta. They raised cattle and horses, and grew wheat, oats and barley. His grand-father’s saddle, chaps, and spurs from those homestead days are proudly displayed in Arnold’s studio. 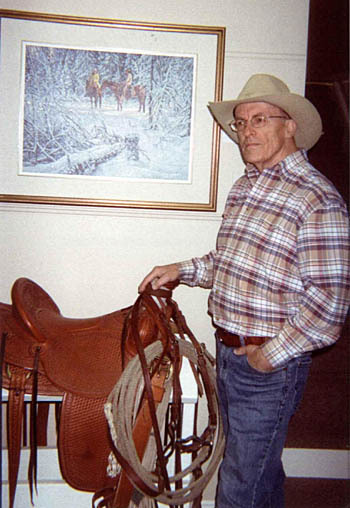 Arnold with his grandfather's saddle. He paints with oils, in primary colours, which he mixes to obtain his own hues and tints. Listening to Arnold explain perspective, colour, and changing values between background, middle, and foreground is fascinating. His meticulous attention to details whether they be the subtle indentations of the diamond hitch around a pack, or ripples on a rocky stream, defines his work. In Arnold’s big canvases, such as ‘Patience Required’, or ‘Moving to Summer Pasture’, the clouds of dust around the herd and horses aren’t a wash, they’re carefully painted in. His portrayals of light, movement and structure show his careful observations of the world around him. His art is instantly appealing. The viewer feels drawn into the scene. One can almost hear the bawling of cattle, feel the sunshine warming a cowboy as he rests on a grassy hillside, smell the tang of autumn leaves, or shiver in winter’s first snowstorm. Arnold’s paintings capture the moods of places and people. Although he’s painted since childhood, painting wasn’t always his full time work. Arnold has worked for a Summerland cannery, then as a geological draftsman for Craigmont Mines, and as a draftsman for the B.C. Ministry of Forests in Merritt. He describes the latter as “’ the best job ever”. Nevertheless, one day in 1988, he phoned Sonia and said, “ I just quit my job!” They still had one child at home. Arnold would now have to paint for a living. He says, “ I couldn’t have done it without Sonia. She’s always been one hundred percent supportive.” Sonia was certainly surprised by the call. Her reaction, then and now, “I always loved his art. And I love him. I knew how much painting meant to him.” Since they married, at eighteen and twenty-three, Sonia has been Arnold’s most loyal fan. Arnold knew painting full time was taking a risk. “But, if I had continued working for the Ministry of Forests till I was sixty-five, I’d have done hunting, fishing and other outdoor activities, and put art on the back burner.” He’d painted western wildlife and landscapes. Now he had more time to study and paint the contemporary working cowboy. The easiest way to do this was to ride along with the cowboys, shoot pictures, do sketches, and observe. “It was easy. I’d phone up the cow-boss and explain what I wanted. I started at the Chutter’s ranch where I borrowed a horse.” Arnold has done a lot of riding with the cowboys of the Douglas Lake, and Nicola ranches and the Quilchena Cattle Company. “It’s part of the cowboy experience. I like to ride and I like to keep in touch with the cowboys. I take photos and try to stay out of their way. I often put the camera away and get in and help.” He truly lives what he paints, participating in round-ups or branding. “I’ve been in some near wrecks and some real wrecks riding borrowed horses!” Arnold smiles wryly. Once when his camera shutter clicked he was on a skittish horse. The horse bucked, he dropped the camera, lost one rein and one foot came out of the stirrup. Almost a disaster, but he got the horse under control. Arnold in his studio in Merritt. When Arnold began full time painting in 1988 Western art was really big. “If an artist painted something resembling a horse or a cow, it sold. A month after I quit, I had a show at the Peters Gallery in Kamloops. Buyers were lined up around the block. The show sold out. About a year after that, the Western market went down.” To cope with the declining market for big original canvases, Arnold got into cards, prints, and smaller canvases. “You move on and keep going.” is his motto. His art has had wide distribution. He’s exhibited at the Calgary Stampede and the Kamloops Cowboy Festival. He had a one-man exhibition at the Kamloops Art Gallery. He was juried into the CE & Western Art Show in Calgary, the San Dimas Festival of the Arts, San Dimas, Ca., the Phippen Museum Fine Art Show and Sale, Prescott, Arizona, to name a few. His work is available in galleries in Canada and the U.S. For five years Arnold and Sonia took his painting to the U.S. where they had rewarding shows in California, Spokane, Wa., and Prescott, AZ. Copies of his paintings have been featured on the covers of souvenir programs of the famous Merritt Mountain Music Festival. 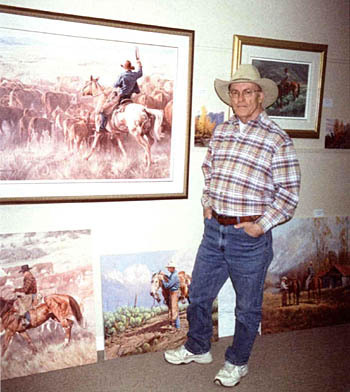 From his Image Of The West Art Gallery at his home in Merritt, Arnold has sold his work into Texas, Wyoming, and Montana to collectors who also value the land and way of life he loves, and paints so well.